I enjoyed writing this article eons ago. Check it out. I watch a lot of Animal Planet. I ask you to bear with me. They have two kinds of shows on the channel. There is Finding Bigfoot, a program about four researchers discovering, through evidence, the existence of a new human-like animal in the world. There is also a program called River Monsters. It is a program where a man goes to different locations around the world to define what people, local to that area, consider monsters. He, however, uncovers local wildlife that usually plays the part of the monster. The difference between the shows is in most cases, on River Monsters, people see the monster that causes the problem, usually an overgrown fish or even strange fish in that area. The researcher Jeremy Wade makes it a point to define his monsters, in almost every program. On Finding Bigfoot, Bigfoot is still out there. I feel both of these shows are necessary. This is how it all relates, in my eyes, to the discovery of the Higgs Boson particle, or element. In an article, at CBS News, at http://www.cbsnews.com/8301-205_162-57574534/god-particle-why-the-higgs-boson-matters/, it talks about a very revolutionary idea that is in its early stages. In one corner, God has numbers of books written about him, her or it, and many spiritual followers. In another corner, a particle may exist that defines what God is and could forever change the understanding of spirituality and religion, in at least Catholicism, and Christianity. 1) What is something that you to wish remain undiscovered? 2) What do you think about the discovery of the Higgs Boson? I would take Biology 101 in college. In that class, I would go over a chapter that would deal with the Big Bang Theory. The start of the explanation of the Big Bang Theory was very clear, from its complex stars to its quasars. The explanation would run into a problem, as the origin of the universe was not clear. My teacher at the time would only define that start of the universe as “The Hand of God.” At the time, there was no clear definition of what element would start the universe. Years later, there is now a face to represent just what could be the start of the universe, The Higgs Boson. This is what I understand the Higgs Boson to represent. I think it is a cool concept but I, as a Catholic, and Christian, feel concern for that concept, especially when its sole purpose may be to define God. The Higgs Boson could lead to an understanding of how to measure, weigh and define God. It could become the evidence that defines whether God left his mark on this planet or if nature just left its mark. The Higgs Boson particle, or element, could lead humans to the discover how to create life, how to defeat death, how to stop aging or even how to control the universe and how to form it. All of the above possibilities are extreme but very real subjects that may be part of the news, and history, years from now, if the Higgs Boson is what it claims. The reality is the Higgs Boson is a very exciting discovery. Though as a Catholic, and Christian, I have a very real concern about someone defining the possible lack of existence of God. I feel it may not be true but it is, now, a very real possibility that has scary consequences. Let us imagine if God is energy or concept that we can now control. The Big Bang Theory holds all the answers. What if creationism becomes just a concept taught in history classes? What if people can burn bibles, as they become only relics of a once, world renown religion? Religion becomes a joke. What if there were no more churches? What if there were no more large structures to visit on Saturdays or Sundays for spiritual and social well being? I know all of it seems extreme but it is a real possibility with the discovery of this Higgs Boson particle, or element. What happens to the concept of faith, religion, the idea of spirituality and all of the concepts that serve as the foundation of the United States of America? As defining God becomes the focus of scientific effort, I have a real concern at just what these scientists will find. I would ask scientist to bottle it up, whatever they find. People are extremely fallible. People can erupt over changes in older traditions, at times. What is in man or woman’s mind that would make them think that just because they know the answer, to what they think is a problem, they should control it or have the right to shape it? The Higgs Boson could lead some person, or people, toward an opportunity. That opportunity is the right to shape the world, in the same way God in literature and reality, shapes the world. It would be a man or woman defining what is and what is not to exist in this world. I feel this should not be the case. It would be the discovery of true power by a fallible person, or people. Who exactly would have the right to control that power? If you look at just the United States, and who has power and who does not, power can corrupt any person. People are too different. Everyone has different opinions. Everyone has different agendas. I hope, unlike the people in Raiders of the Ark, these scientists leave the mystery in its box. Throw away the key, no need to have their faces melt off. The world has its Finding Bigfoots and River Monsters for a reason. Let it all exist as it is. Let God sort it. The Standard Model, a theory put in place in the early 1970s, explains the basic makeup of matter. It also explains how that matter interacts in particle physics. The theory has been through its test and proven correct in its use, thus far. The Higgs Boson, the particle that acts on matter, has this purpose. All particles, in the universe, would pass through what known as the Higgs Field, and other fields. The Higgs Field exists in the universe to provide particles with different levels of mass. The Higgs Boson seems like the particle, and the carrier, responsible for passing this mass to various particles in the universe. This is very good. It could go a long way in explaining a concept like the Big Bang Theory but the question is, still, would the world be ready to leave mystery in the past? Would you be content in a world with no mystery? You can find out more about the Higgs Boson at How Stuff Works, in the article What exactly is the Higgs Boson? at http://science.howstuffworks.com/higgs-boson1.htm. You can also find out more about the Higgs Boson at The Christian Science Monitor, in the article Beyond the Higgs boson: Five more elusive particle at http://www.csmonitor.com/Science/2013/0315/Beyond-the-Higgs-boson-Five-more-elusive-particles. You can find out more about the The Standard Model at CERN, which stands for Conseil Européen pour la Recherche Nucléaire or the European Council for Nuclear Research, in the article The Standard Model at http://home.web.cern.ch/about/physics/standard-model. You can find out more about the Supersymmetry at Of Particular Significance Conversations About Science with Theoretical Physicist Matt Strassler, in the article Supersymmetry — What Is It? at http://profmattstrassler.com/articles-and-posts/some-speculative-theoretical-ideas-for-the-lhc/supersymmetry/supersymmetry-what-is-it/. I have to admit something. There are times that I have written short stories. A while back I had written a story for a major horror press, Dark Chapter Press. I had my work accepted. 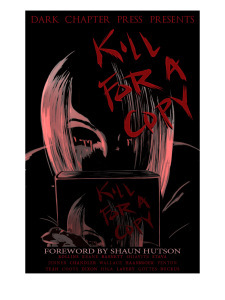 With that not only comes an opportunity to show my piece, in a strong anthology, Kill For A Copy, but the opportunity for the work to be produced at an even higher level. This is where you might be able to help. The work exists as a Kickstarter opportunity. You want to have some fun being scared? You like reading? You like introductions written by a great writer? Help and contribute. The idea is to add to a project and help to make this anthology one of the strongest in history. You can be part of it. Visit the Kickstarter page, at https://www.kickstarter.com/projects/1319364316/kill-for-a-copy-a-dark-chapter-press-horror-anthol, and find a dark corner ahead of time. Turn up your senses. Quiver. Shake. Know how good it feels to be scared in the summer; winter, and even in the fall. In reality, it is an opportunity to enjoy works written by some of the most effective manufacturers of fear. Contribute to become a not only the owner of one of the hottest anthologies on the market, but pledge just enough, and become part of the horror. You can become a character in future short stories, in upcoming anthologies, written by Jack Rollins, Stuart Keane, and even M.R. Wallace. This is real. Come on. Contribute and be part of the horror history, presented by Dark Chapter Press. I had definitely my contribution and I am sure you might crap your pants. Thank you for your time, and the opportunity.